Product prices and availability are accurate as of 2019-04-22 16:33:19 EDT and are subject to change. Any price and availability information displayed on http://www.amazon.com/ at the time of purchase will apply to the purchase of this product. Black Beauty Zucchini is an heirloom squash with very tender, creamy white, flavorful flesh. 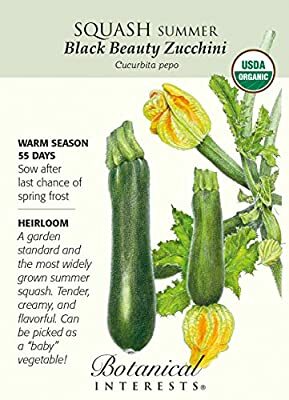 The prolific squash grow on compact bush type plants and can be harvested as 'baby vegetables' or allowed to grow as long as 6" before eating. They can be steamed, grilled, sauteed, eaten raw in salads, and made into relish or breads. If left on the vine too long, zucchinis can grow to the size of a small state (but are somewhat pithy to eat). We have found that baseball bat-sized zucchinis make wonderful doorstops during winter, but you can always resort to the old-fashioned method of dropping your excess crop on your neighbor's doorstep, ringing the doorbell, and then running before they grow that big! If you have a small garden and are worried about having too many zucchinis, try growing the plants in large containers. Production may be somewhat slower in that environment and allow you to pick and eat as the squash mature. This packet plants: 4 hills or 11 plants after thinning.